The mobile applications also are known as a wallet at present time in which people can store money, documents, personal data and business record which is possible for Android mobile app developers. Once a developer develops the application, they must know the development lifecycle of mobile app development in Android & iOS platform. That’s why the graduate and undergraduate student think about that How to Become a Mobile App Developer in Android or iOS Platform. The younger generation take the Mobile App development Training in Jaipur with BR Brains Company where they can build the Mobile App Development Services off and understand that how it is useful for a business and service bases because the smartphone apps provide the best services like; online food order, online cab booking, game playing, online banking app, money wallet app and much more reliable services like this. If you are a college student, graduate students, and another meadow student then you can choose the mobile app development career in Android and iOS field, Also you can join the best companies but this possibility you can get this opportunity after the Mobile App Development Training. Here we are providing some step of app development. Identify the app development plan and resolve the problem planing. Platform choosing (Android or iOS). Build a native, hybrid and web application. Test the app for effective goals. Always keep your app data secure. 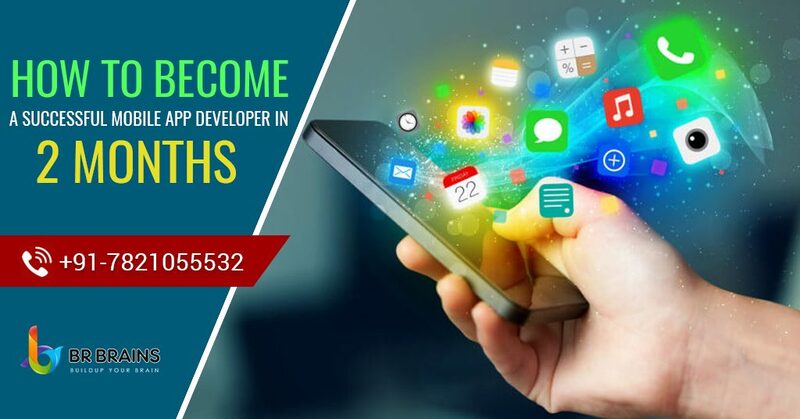 So you can join our BR Brains android training company and grab the best mobile app development opportunity to get placed in the best mobile app development company offering.